It’s here! The BIG Color Lovers reveal day has arrived. Before I dive into unveiling how the living room over at The Little Cottage looks now, after weeks & weeks of work (and years of waiting! )… I have to give credit to my husband, whom I never could have done all this without. Thank you so much for your support on this project and for everything you helped with honey! I love you! And to Kelly, from kellyelko.com, for inviting me along for this month-long design challenge. I can’t wait to see the nine other bloggers spaces and see the changes they have made. Don’t forget to visit them too, I added links to everyone at the bottom of my post. 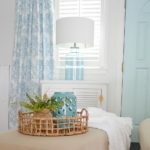 I am so excited to share the biggest room makeover to date over at The Little Cottage with you today. I know I say “excited” a lot, and I always mean it, but this… THIS is a big deal. After years of permit chasing and hoop jumping and good old fashioned hard work… The Little Cottage is taking it’s biggest leap into becoming a true home-away-from-home for family & friends. This is the first full room I’ve had the opportunity to really furnish and decorate. 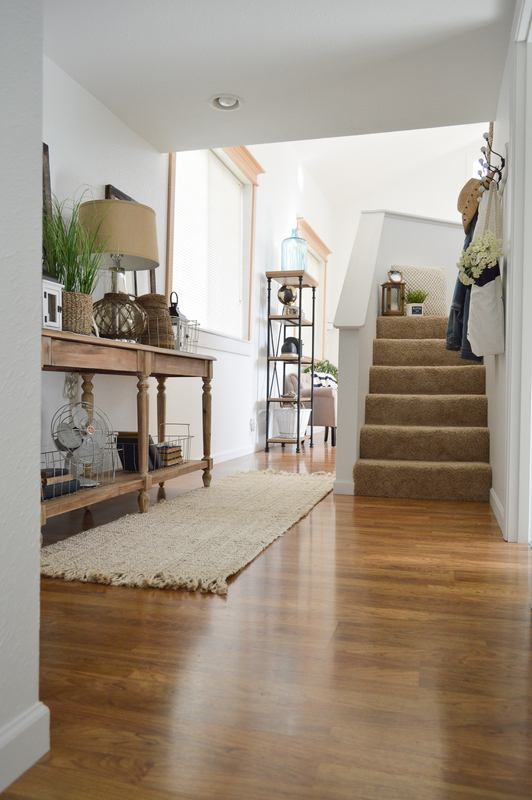 Oh, you got a tiny peek into the main living area when I shared the entryway with you. But she wasn’t completed yet, and didn’t even have paint on all her new window trim. I can not express how joyful I now feel about this room. 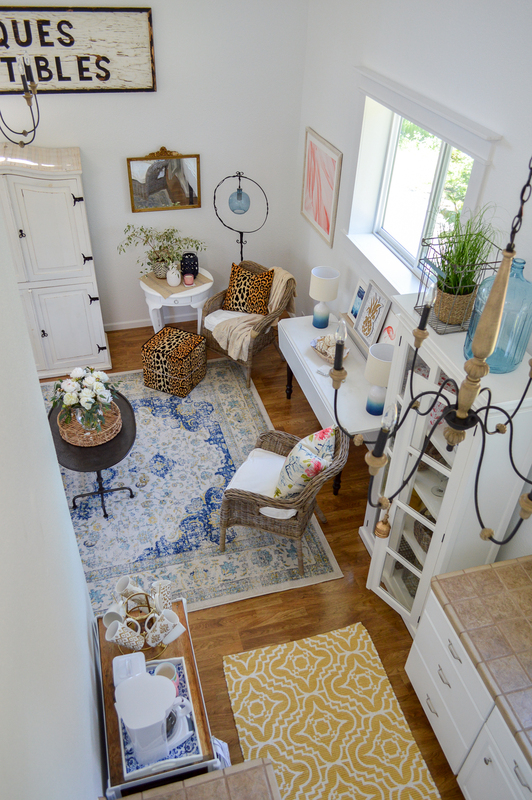 It’s bright and airy, with just the right punches of color, pattern and texture to keep things interesting. 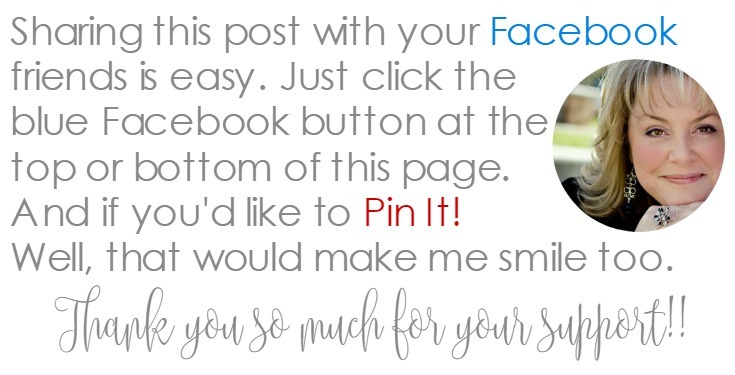 As always, I’ll make sure to include links to everything at the bottom of my post where it’s easy to find and see! 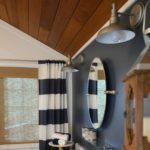 The furnishings & decor I received allowed me to refrain from working on a double scaffold to paint this space, which includes a vaulted ceiling. I actually paid someone to paint! I know… but it was worth me not breaking my neck. I kind of like having an un-broken neck. And I went white… simply because I needed something that would last through decorating whims, I have no desire to re-paint 2 story walls and cut-in at the ceiling. Getting to start with fresh clean walls, with no giant holes, was a dream. After acting as a make-shift work shop, the walls were much worse than you can see in the before pictures. But enough about that, let’s look at pretty things! 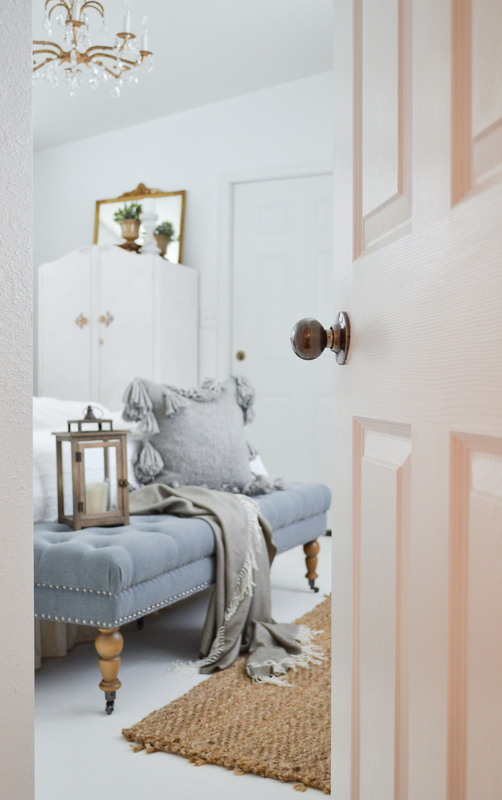 Like my dreamy white love seat from Birch Lane. After many years of longing, I have myself a white sofa! It’s the perfect size, the perfect profile, and the perfect backdrop to showcase any pillow I desire! And I seriously desired these sumptuous leopard numbers from Tonic Living. 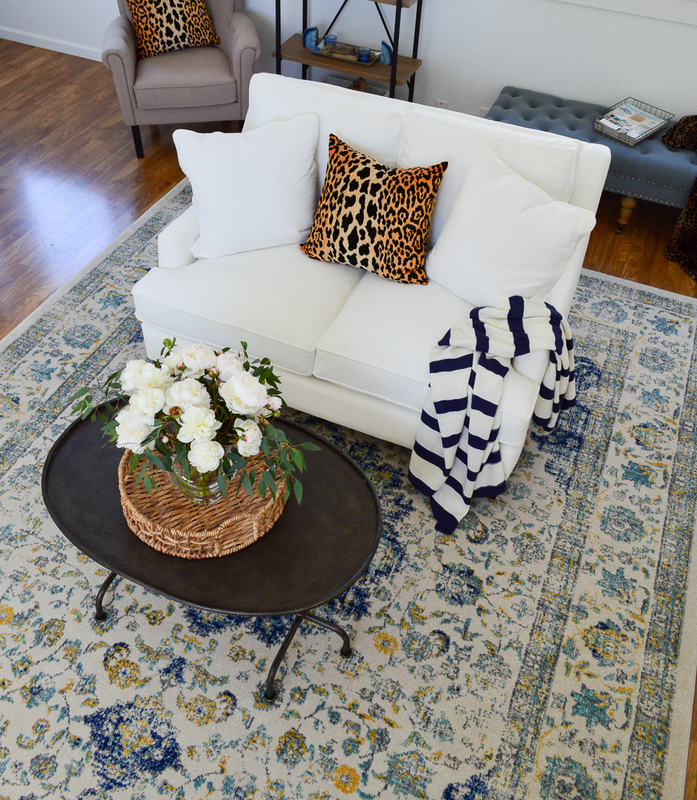 For my space, I decided to anchor the room with color by using a rug featuring navy, aqua & gold, and to let my furniture “float” (more on that later). I then proceeded to pepper the space with color, pattern and textures. 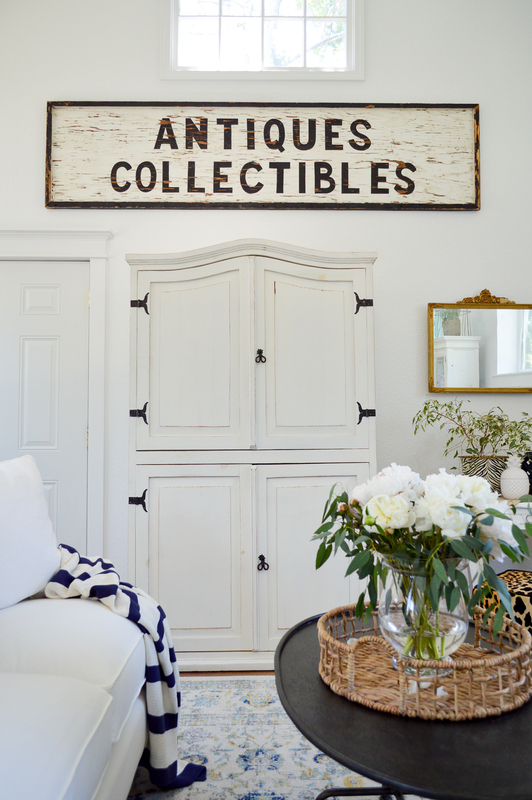 Oh the textures... like my chipping ANTIQUES COLLECTIBLES vintage sign. For many of you that follow me, you know I’ve been saving this gem for awhile. Over a year actually. I knew this was the place for it the second I saw it, on that rainy day we spent over in the valley picking and hunting! It traveled home with us on top of the van, and then, it waited. It’s bold and wonderful. 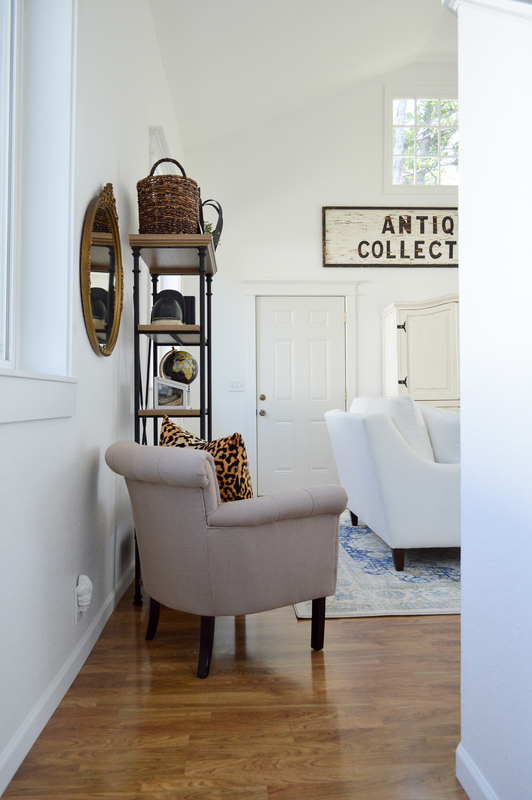 I love the impact of black and white, and I carried it throughout the space. It’s actually my base. And I can add and delete just about any color I like. It’s repeated in the room over and over. Some of you may recognize this shelf. It (and several other things) migrated over from the main house. The black pipe detail fits in wonderfully! 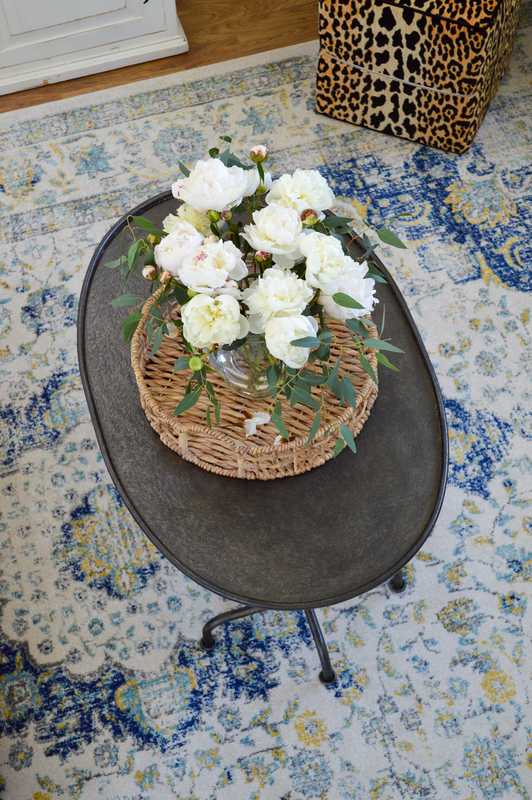 Adding in some navy, a decorating color that I pulled from the rug, makes perfect sense with our coastal location. 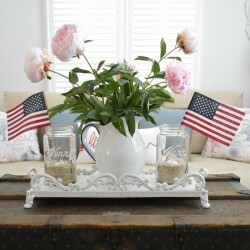 I definitely gave a nod to Summer with bits of nautical/coastal decor. 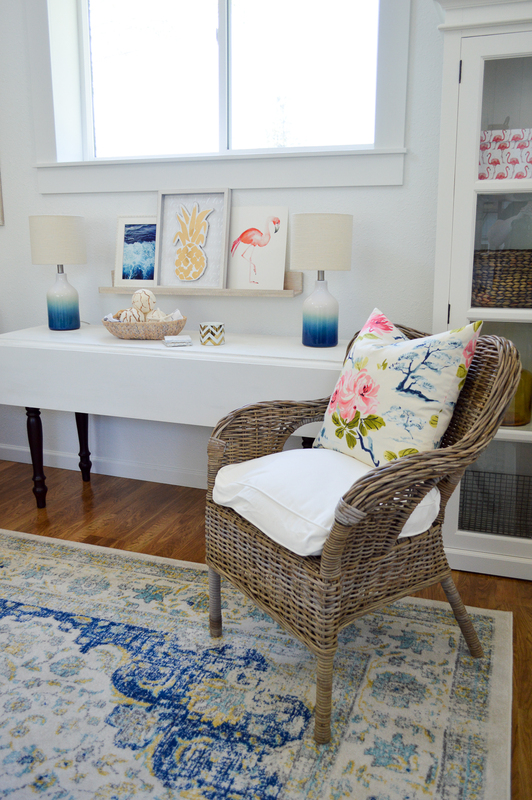 You can just get a peek at the tufted bench next to the shelf. I’ve got it tucked under the window, and back behind the love seat. 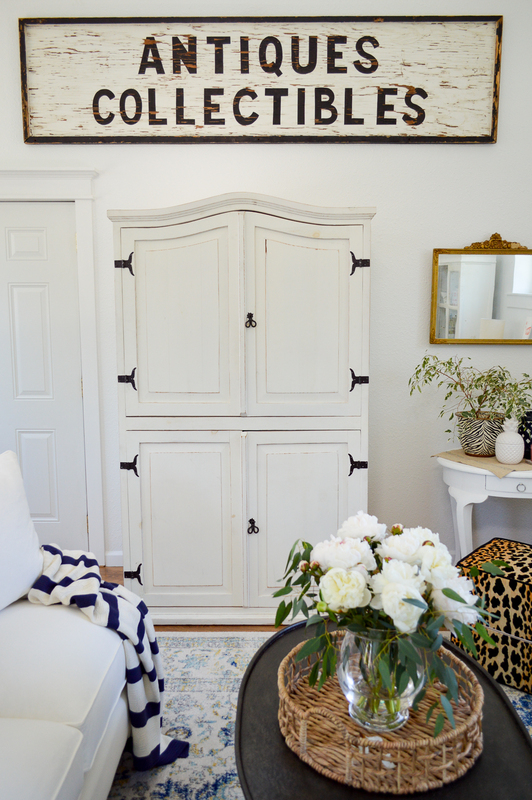 I purchased it on a whim when it popped up on a steep sale, after I envisioned it working so well in this space!! 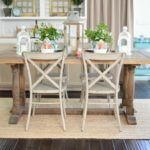 It’s the perfect height to pull up to the drop leaf dining table, so I can add it in front, or pull out the table and seat 4-6 easily, with everything that is already in the room! It can also be used as an ottoman/coffee table in front of the love seat. I really wanted things to work double and triple duty if possible. Speaking of coffee tables. This beauty from The Mine caught my eye for so many reasons. I feel like the hammered effect and the deep color really anchor the center of the room. 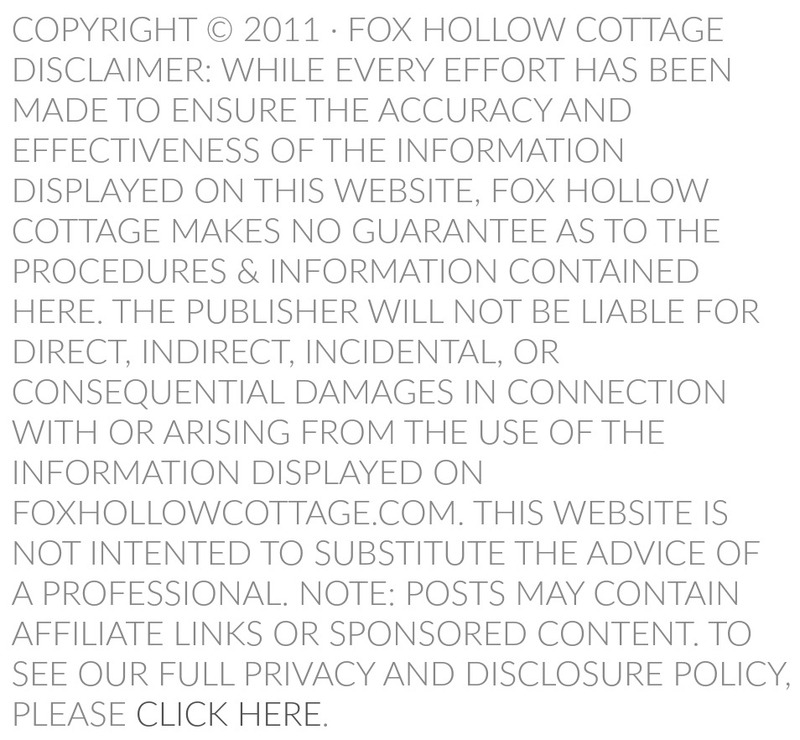 I love that it looks like it was forged. And it plays wonderfully with the hardware on the armoire, the pipes on the shelf, and the hammered metal on the light fixtures. While at the same time, it’s not too heavy because the legs lend it an airy quality. In short, and in my opinion, it’s not too visually ‘weighty’ for the space. This is what I was talking about, when I referred to the furniture floating. 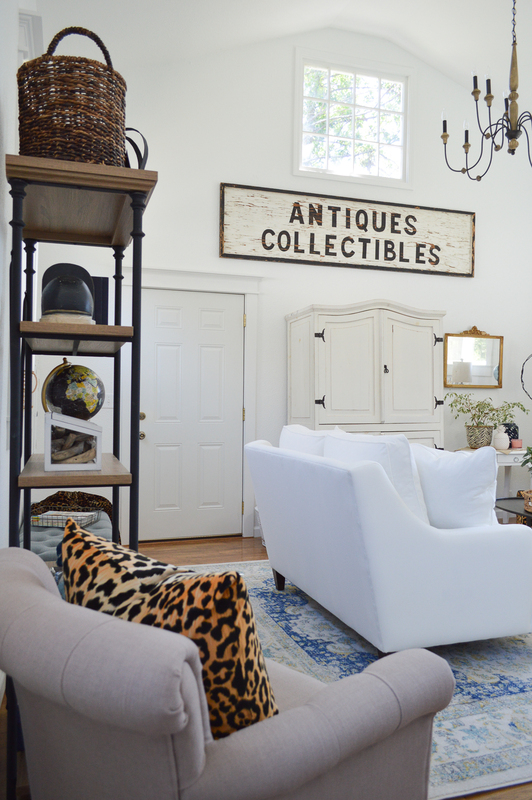 Both my pieces in the middle of the room, have feet, as do all the other furnishings in the room, with the exception of the armoire, and the glass front cabinet. 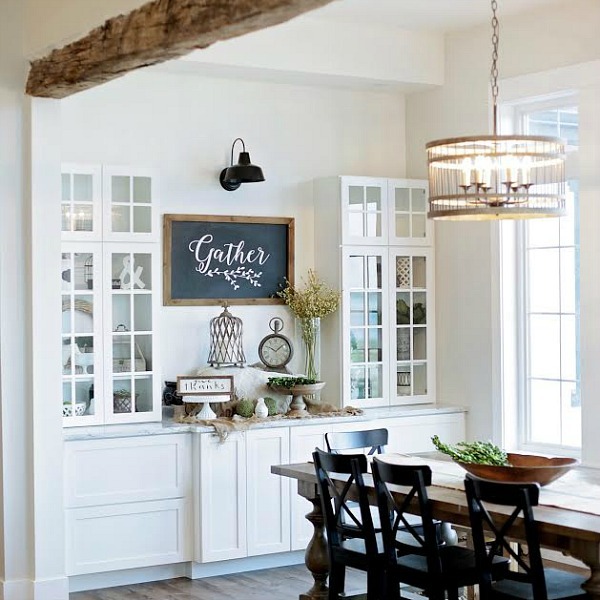 The pretty white wood & glass cabinet, sits right between the living area and the kitchen, she bridges the space beautifully… and her lines mimic those of the new window trim, and the baseboard detail of the kitchen cabinets. 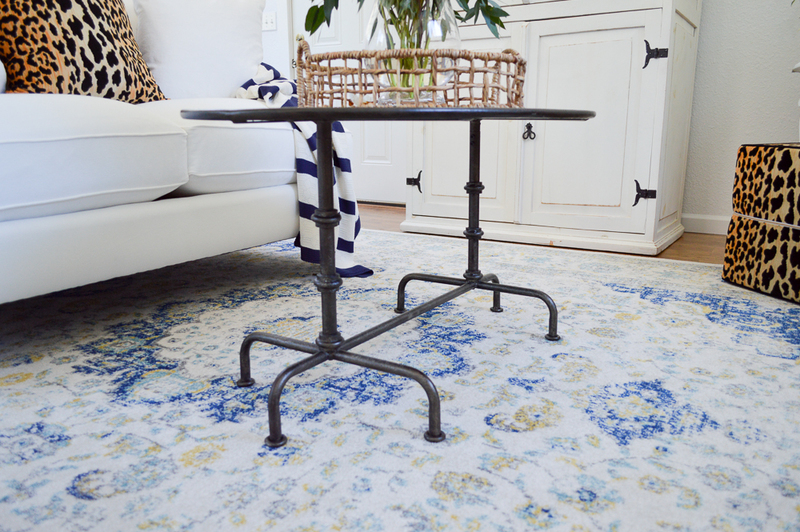 Beside falling in love with that new farm table I scored for the main house a few months ago, the actual reason I bought it, was because I came to the conclusion that the one we were using would be even better down here at The Little Cottage. You don’t see many solid wood, rectangle shaped, drop-leaf tables for $30. I wasn’t real confident I’d find two. I’m glad I went with my gut and made the move. When not in use, it’s more like a console table. 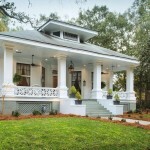 Yet, it will easily accommodate two people with the front leaf popped up. 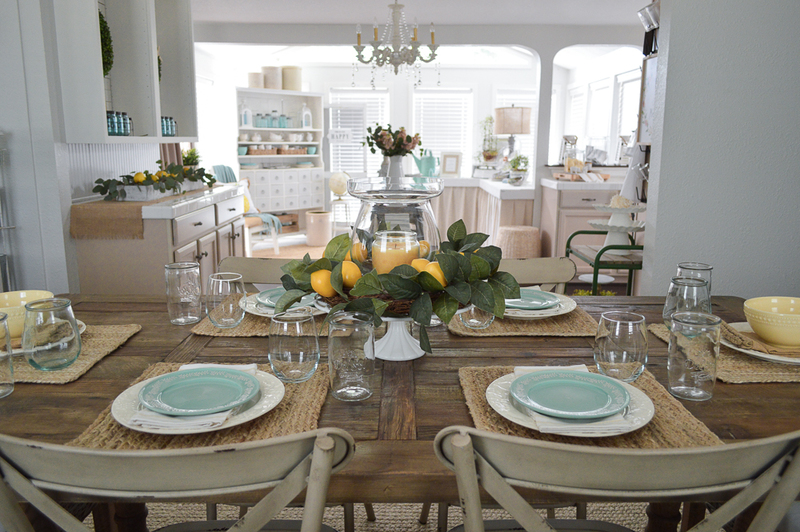 The wicker chairs clear the table and you can scoot right up. And like I mentioned earlier, the tufted bench works here too! 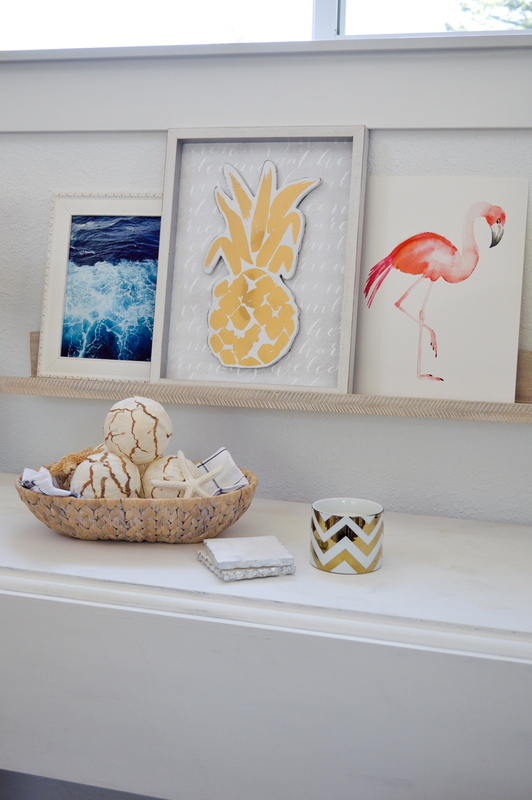 This handy little art shelf, from Minted, allows me to add decor to suit my mood, color whimsy or season… while keeping the table surface open for practical use. 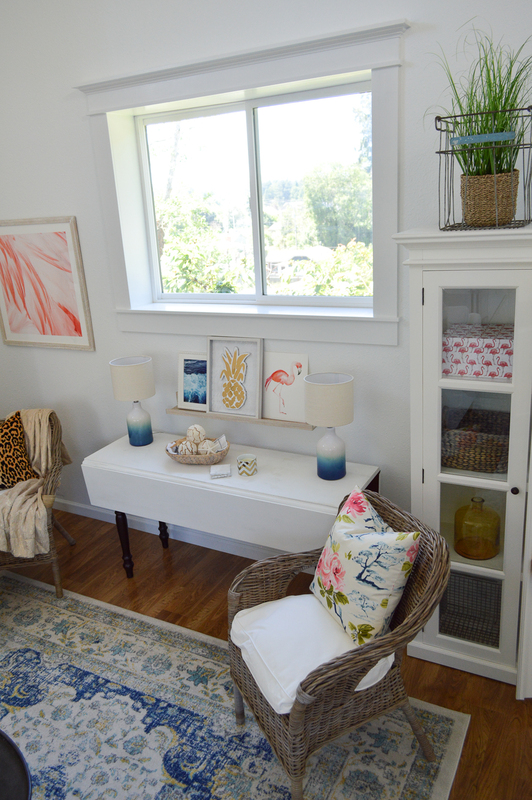 I selected the herringbone because it matches the frame on my big Flamingo feather art. I tried like crazy to get a good picture of it up close, it’s so dreamy… it’s just the sort of thing you can gaze at, and kind of get lost in… the color and texture is so appealing to me! 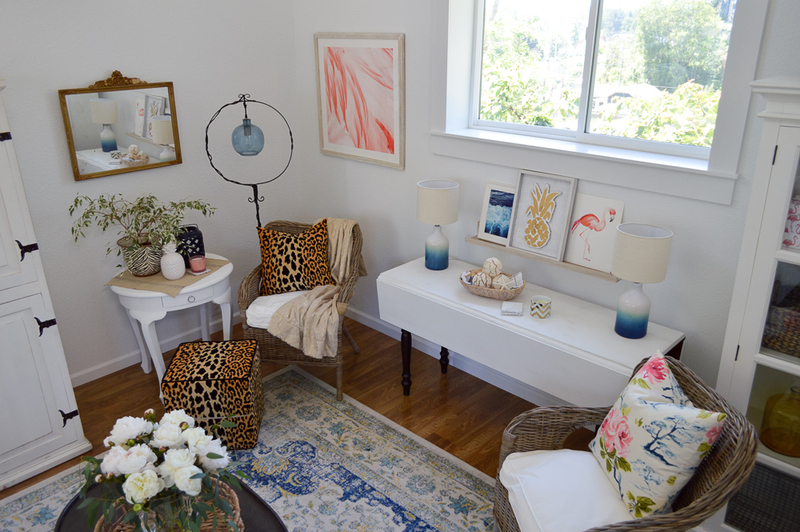 I had so much fun infusing the room with color with the addition of art & accessories! 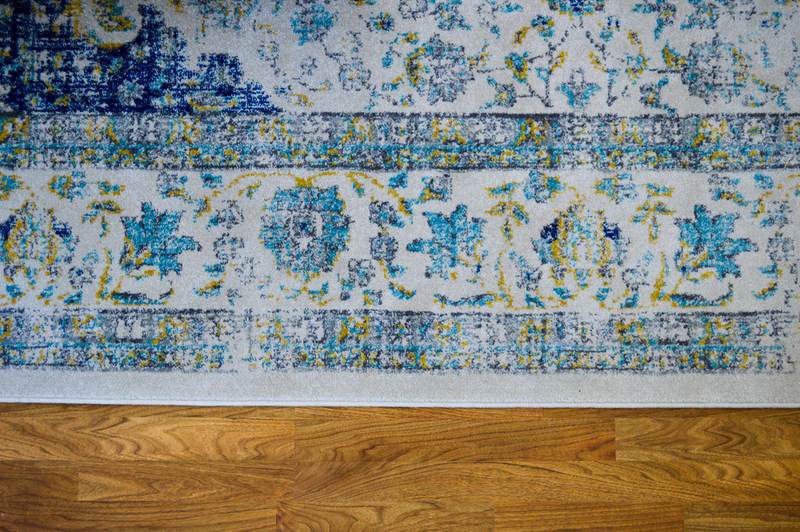 I pulled all the blues and the golds from the rug… and the Flamingo pink? It was pretty much just a “because I felt like it” kind of thing! I somehow got Leopard and Flamingo stuck in my head… and just I went with it. Minted had so many art options, but I kept coming back to the Flamingo. And I was able to customize it with the frame. In fact, it’s one of the best interactive sites I’ve ever shopped. You can change the frames & mat styles, and they show you every option, with several views, so you really know exactly what you are getting before you order. 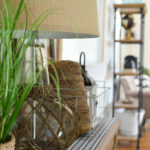 The lamp in the corner is actually a vintage birdcage holder, that I added a clearance pendant light too, to create a make-shift ‘floor lamp”. I should to take a picture of it at night, because the blue glass is wavy, and it looks like water on the walls. I picked it up on clearance for $13.99 and I already had the bird cage stand. The beauty of my basics, is that I can play with color over here, whenever the mood strikes! Who knows what I’ll do next? I do know that I love hidden storage, and that pulling this beast out of our room, and letting it shine down here was a great decision. 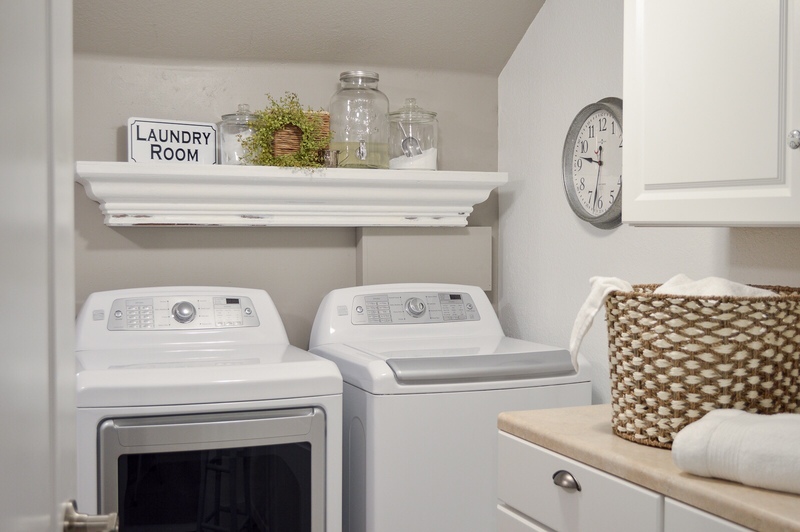 It houses the TV and DVD player, but keeps them out of sight when not in use. Plus, it was wasting away in our bedroom… without anyone to appreciate it. It shines down here and I can’t think of a better place for it! What you are seeing so far today, is really just phase one, I’ve got more plans for this space… but there are so many things that went into getting here, that don’t even show. 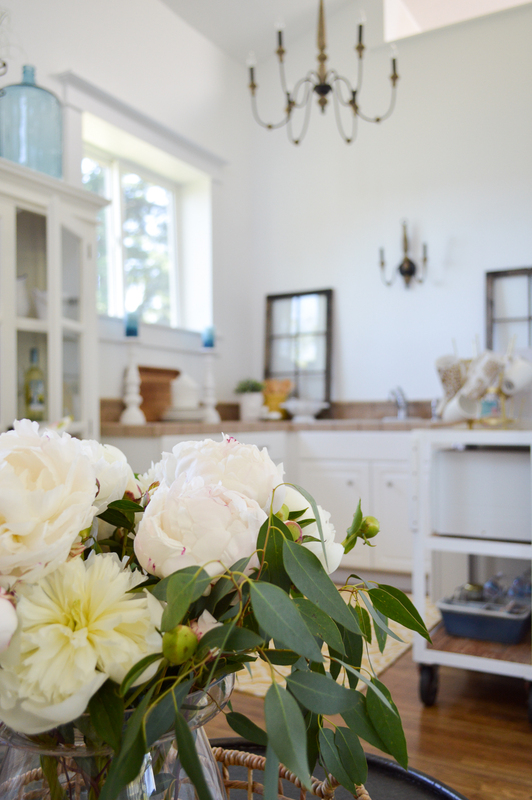 Things like re-doing every electrical outlet and light switch, and re-building the window sills before we could even think about adding decorative trim/mouldings and ordering window coverings (which are on the way, but didn’t make it in time for the reveal). The kitchen will of course get more attention later. For this project I tried to stay focused on the living room/dining space. For now, we’ve removed the upper cabinets, repaired the wall and added window trim. I did buy a coordinating suite of lights for the space and Jimmy installed them. 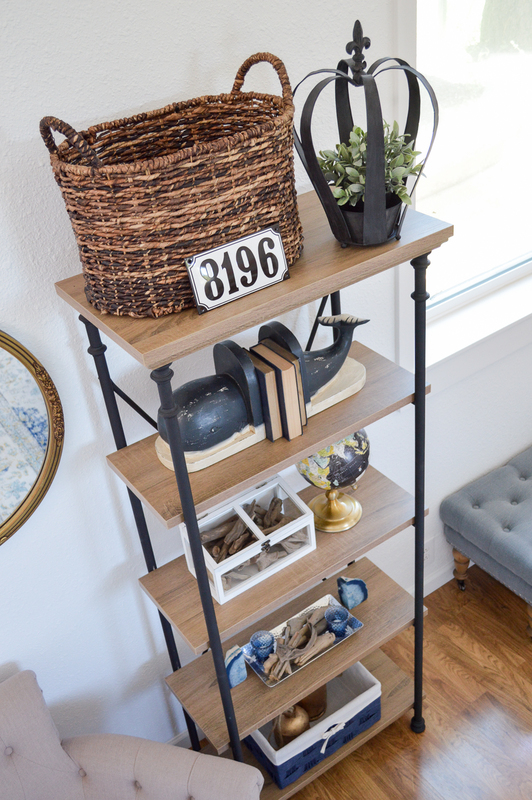 I also made over an old work cart – and I stinking LOVE it so much!! Thank you SO much for listening to me blather. It’s just been such a long wait, and I am beyond thrilled to have brought the space this far. I swear the poor little thing sighed when I was done. 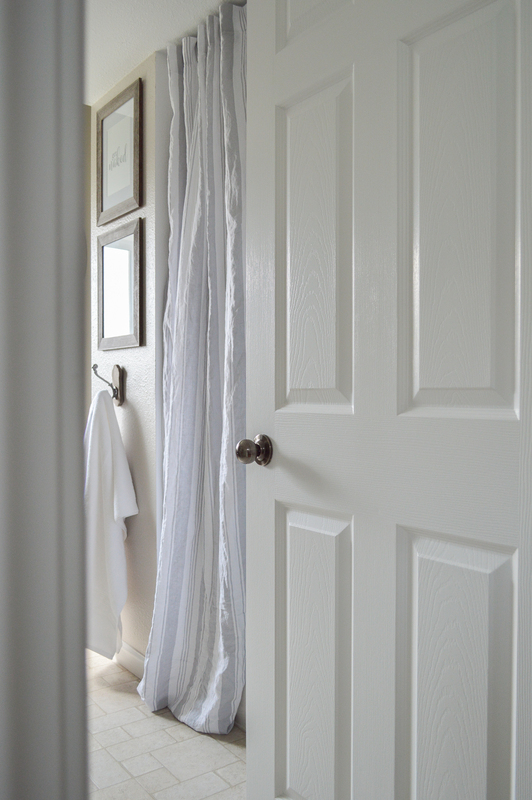 The time got away from me… and I didn’t get to paint the door. Fantastic!!!! Airb&b? Bliss’s Escape? 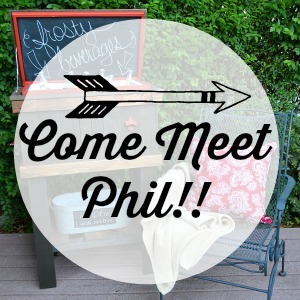 Whatever it is, when I hit the west coast on my blogging buddy trek sign me up for an overnight! Leopards and flamingoes! 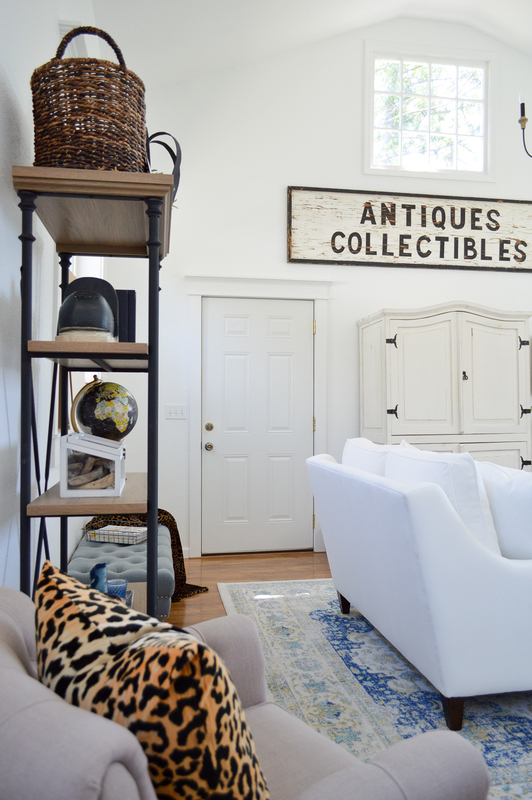 And it works … because it’s not a space just filled with decorative accessories on display, it’s a retreat filled with beautiful treasures! Great colors, patterns and textures, Shannon! Interest and peace everywhere you look. Love it! Roe, I love you comment, just like you. You are so kind. I was telling my mom all about your wall today so she would make sure to visit your tour. Still thinking about it!! What a wonderful space Shannon!! I love the transformation. 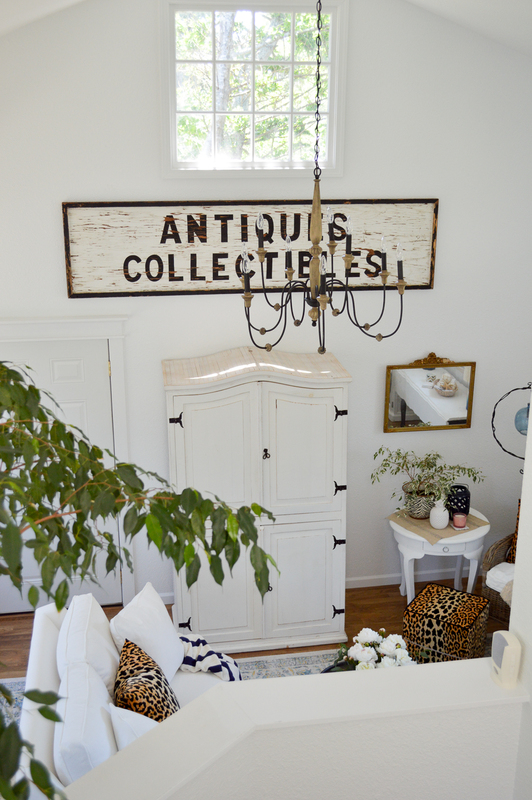 I love how you incorporated old vintage treasures with new finds. 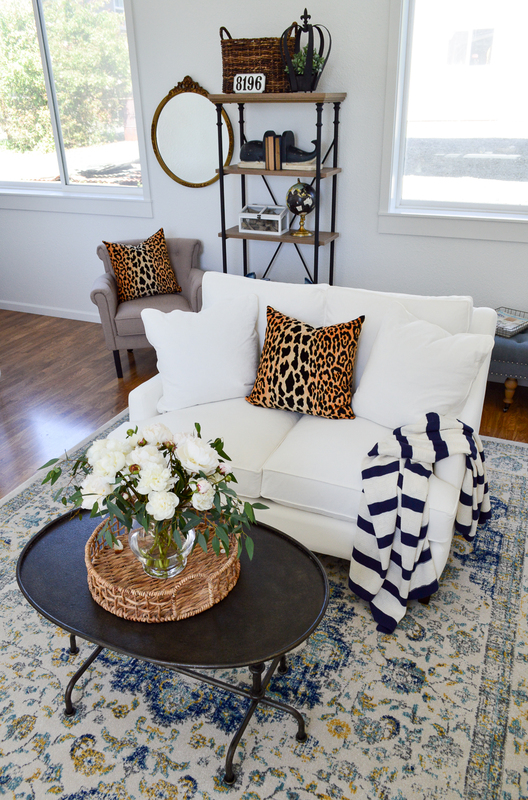 And the leopard pillows are a fun contrast. It’s beautiful!! Love, love, love it!!! Your hard work has paid off, friend … you and your hubs are a great team! Seriously, this space is just beautiful … the colors … the textures … the goodies! 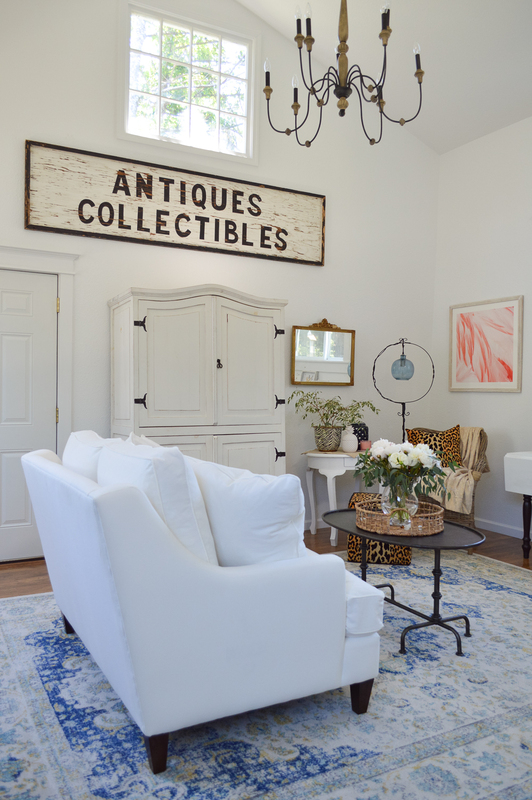 That chandie is fabulous … love the sign … and, well, you know I love the rug! What are the dimensions of the room and what size rug did you order? Um, I have no idea. lol. Not really big, it just seems like it since the ceilings is vaulted. The rug is a 9 X 12 (and they are having a 70+20 percent off sale again right now) I don’t get paid for saying that, and I bought my own rug. Shannon, wow it’s so gorgeous! 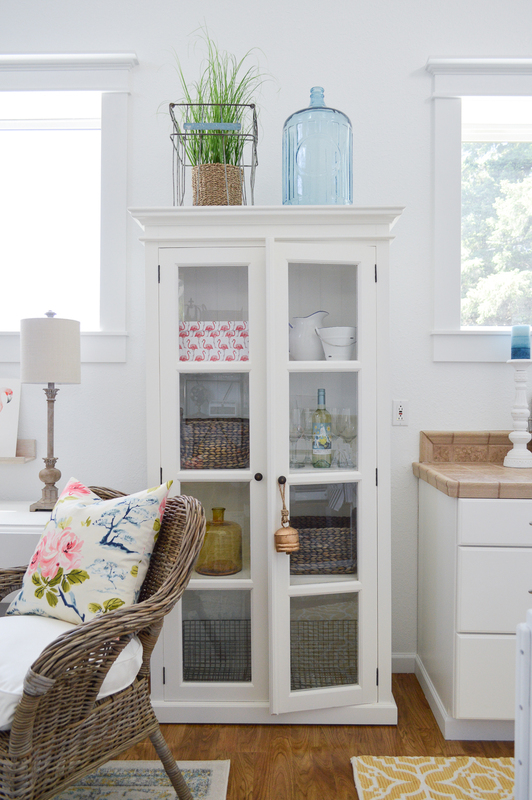 I just love what you’ve done to this little cottage space. You have such a nice touch and everything flows so well together. 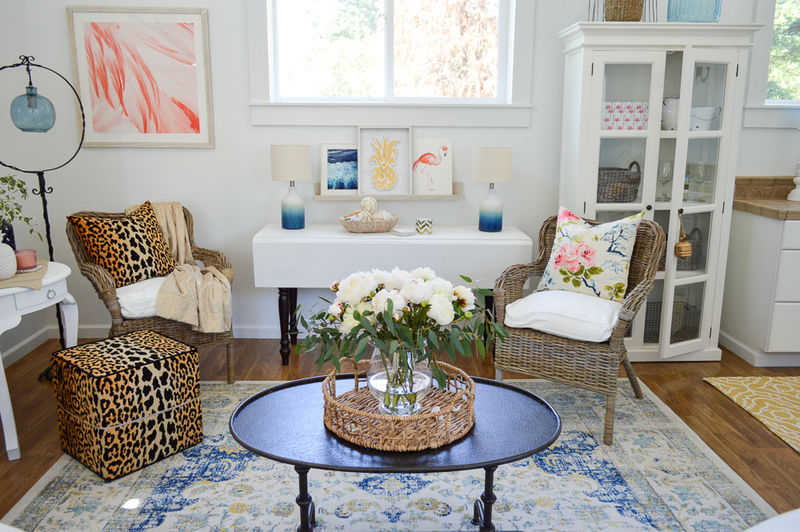 I’m in love with that rug and white loveseat. Great job, girlie on pulling this all together. It’s so interesting and welcoming! Thank you so very much! Appreciate that Rhoda 🙂 I’m looking forward to hosting guests and putting phase two into effect after enjoying some Summer weather. Wow Shannon! What a cozy cottage. 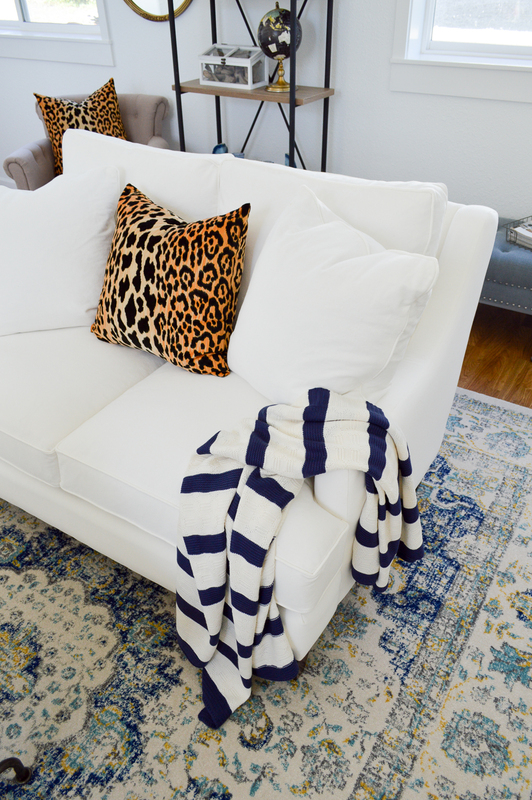 I love the blue rug and you know this Jersey girls loves leopard! What was the final cost? It seems like you had to buy a lot of stuff. I never added it up, I bought stuff here and there over time, and hoarded it. lol! Was there something particular you wanted the cost of? Happy to help. No, nothing in particular. It is a Beautilful room but look pricey. I’m a big fan of reusing and free finding. This transformation is just stunning!! I can’t imagine the satisfaction you must feel!! Absolutely love all the design choices! I’m giving you a virtual standing ovation!!! Awe shucks! The only one I’ll ever get, cause this girl can not sing or dance. haha. Shannon! You killed it!!! 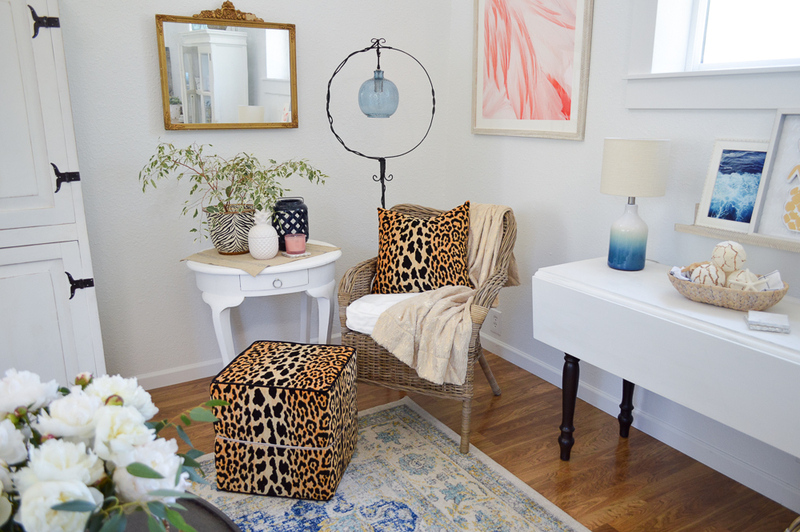 The leopard print is such an unexpected perfect addition. I could write an entire paragraph about this space. Absolutely stunning my dear friend. Rawr. I love it too. Had to have it! So glad you like the space 🙂 THANK YOU! Very nice Shannon and the rug really grounds the float! I thought so too – Thanks Janet!! The room is gorgeous. 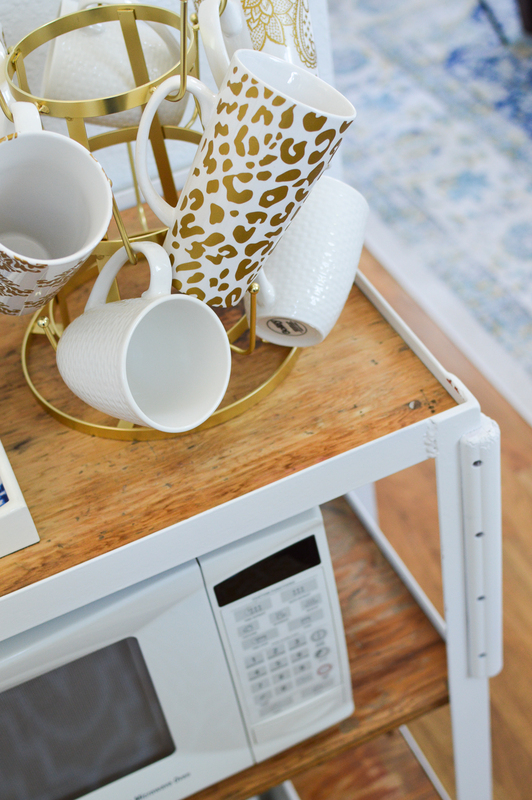 Love blue and white with pops of gold. Just my style. 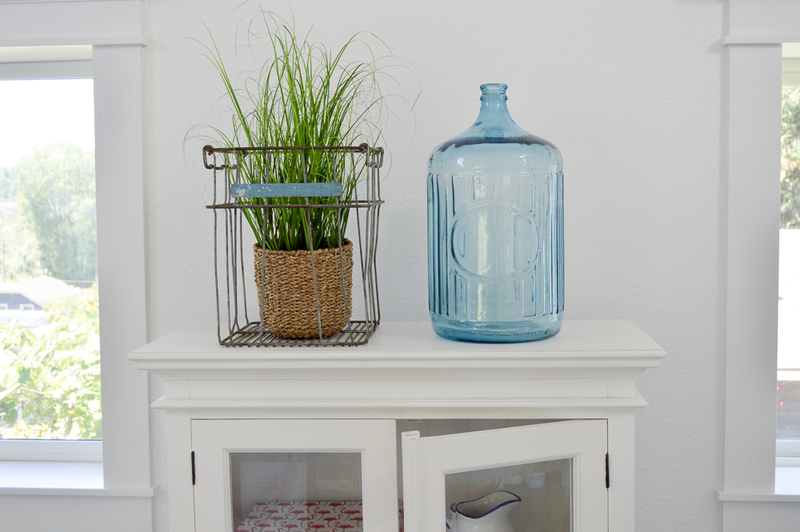 I am in love the floor lamp with the blue glass shade. Is it vintage. Where is it from. Thank you sharing your beautiful work. Thank you Mary. That is something I made up, the stand is a vintage bird cage holder, and I got the light on clearance at Ross for $13.99 – I’ve noticed Ross and HomeGoods have both had really reasonable hanging lights the last few times I’ve visited! 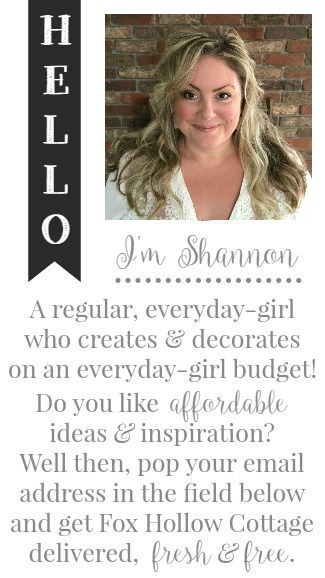 Fabulous space, Shannon. Just have a ladder ready for me when I come visit because that sign needs to come home with me. What a great find! Ha! You’ve got me cracking up laughing way to early in the day. It’s not even 6 here yet. haha. I feel the same about so many of your finds 🙂 Thanks honey! Anne that whole suite of lights was just over $400, for all three!! They were such a steal. It's here! The BIG reveal day has arrived and I can't wait to show you how we've transformed our old workshop into a welcoming living room retreat!